When visitors from home asked my husband and I to join them on a side trip to Orvieto, only an hour by train from Rome, we accepted the invitation with alacrity. We decided to take the morning train, which would get us to Orvieto a little before lunch and just in time to check into our B&B. While my husband, (the one who had to work) would take the afternoon train. We all woke up early and headed to the bus stop. We needed to take the Metro to Termini Station, where we would be taking the regional train to Orvieto. As we stood waiting for the bus with our suitcases, a kind man approaches us and tells us that there was a bus strike, and that all buses and trains were not running on this day. We stood there stunned for a moment and then returned to the apartment. Being intrepid travellers, thoughts of not proceeding to Orvieto lasted but a minute, after which we all scrambled to look for an alternative way to get there. We were lucky enough to find a tour van with 2 women going to Florence, who were willing to drop us off in Orvieto, if we shared the cost with them and if we left right then and there. The only hitch was my husband had a meeting until 2 that afternoon, but he kindly offered to stay behind. Being a “dutiful” dependent spouse, I offered to stay with him. But the rest of the group would not hear of this, clearing a two o’clock departure from Rome with the women going to Florence. After a little over an hour’s drive on the highway to Florence, Orvieto suddenly comes into view lying on top of almost vertical cliffs still surrounded in some parts by defensive walls. The cliffs, I found out later were part of a tufa plateau formed by the eruption of the Volsinii Volcanoes and the walls which were built right on them made use of the same material. It is quite an impressive sight! There are three ways to get up to Orvieto, the first is via the funicolare, the cable car which is found right beside the train station, the next is by using stairs and escalators and the third is driving up. Our driver kindly deposited us beside the station of the funicolare at the top and from there we dragged our suitcases to Valentina’s Bed and Breakfast. Located on Via Vivaria, a charming narrow cobblestoned street, we were given 3 very comfortable apartments with a well appointed common area, a veranda that let in a nice breeze and a coffee machine that churned out cups and cups of delicious Italian coffee! Valentina herself welcomed us and brought us to our accommodations, making sure that we had everything we needed. She was gracious and very helpful even making dinner reservations for us. Orvieto is a charming town of picturesque piazzas, small quaint streets that lead you to some rather impressive sights. The most impressive of these is the Cathedral, which many consider one of Italy’s grandest. Located in the Piazza Duomo, it’s origins are attributed to a doubting priest, a white cloth and a spot of blood. A priest, whose name may have been Peter (no not Thomas) was said to have had doubts that a piece of bread could truly become the Body of Christ during the celebration of the Holy Mass. But as the story goes, one day as he was raising the host during the consecration a spot of blood from the host dripped onto the white altar cloth. Needless to say, he became a believer and brought the cloth to Pope Urban IV who was staying at Orvieto at the time. Unlike Peter the priest, Pope Urban was a true believer, declared a miracle and promised to build a cathedral in Orvieto to house this relic. And that as they say was that. The feast of Corpus Christi was declared and is the most celebrated feast in Orvieto to this day. As for Urban’s promise, the building of this magnificent cathedral was begun. The Cathedral is impressive, not only because of the sheer size of it but also because of the splendour of it’s facade which contrasts with the impressive yet simplicity of its sides. Looking at the facade, one can understand why it is called by some “The Golden Lily of Cathedrals”, adorned as it is with bas relief panels, mosaics, sculptures, towering Gothic spires and the rose window right at the center. On the other hand, the sides of the cathedral are built with alternating rows of basalt and travertine blocks which give it a stripped appearance, simple and elegant. The interior is built with the same material and design in the Gothic style with it’s pointed arches soaring upward. The main altar is dominated by a beautiful stained glass window directly behind it standing between panels of frescoes along both sides. There are two side chapels, the San Brizio Chapel is completely covered with frescoes while the Chapel of the Blessed Corporal houses the reliquary made of silver and enamel which is suppose to house the remnants of the miraculous host. The Piazza Duomo on which the Cathedral stands is a pretty little square with small cafes and stores and the Torre de Maurizio with a bronzed automation (a turbaned man) striking a bell to mark the time, every fifteen minutes. Around and beyond the Duomo is a warren of picturesque, narrow streets, of apartments and shops selling crafts, food stuff and Orvieto’s special white wine. There is so much to see of Orvieto that before we knew it we had to go back to our room to change for dinner. We had an excellent dinner at the Osteria Numero Uno (which I will tell you about at another time) and then strolled down the walkway along the cliffs before calling it a night. The next morning we woke up early to go to the Saturday market in the piazza. This market sells fresh produce like vegetables, fruits, cheese, hams etc. and also dry goods like shirts, dresses, nightgowns, handbags and many, many more. There was even a man selling different kinds of honey made during the different seasons of the year. We bought a lot of fruits, prosciutto and bread for breakfast and brought it back to the common area in our B&B. Everyone ate heartily, each drinking several cups of coffee of one’s preference (espresso, cappuccino, macchiato .... you get the idea). After this we all agreed to meet back at the B&B by 11:30 to check out and take the bus from the Piazza Duomo to the foniculare. Staying overnight in Orvieto (arriving only in the afternoon) is really not enough, because the town itself is so interesting there was no time to visit the museums. What I really wanted to see was the underground city but unfortunately the tours only started at 11 am which was too late for me that Saturday morning and ended at 3 pm which was too early for me having arrived at 3:30 the afternoon before. Is Orvieto worth another visit? I think so! I have visited the Pantheon three times since I arrived in Rome and I know I will be visiting it again and again before I leave. Some consider the Pantheon the preeminent architectural feat of ancient Rome, and I can understand why! I approached the Pantheon from the via di Minerva, seeing GianLorenzo Bernini's statue of a playful baby elephant affectionately known as "little Chick", seeing the Pantheon from it's side and then walked around to the front. It was completed sometime in 125 AD under the Emperor Hadrian and was built atop an older structure (27BC) by Marcus Agrippa, Augustus Caesar’s son-in-law and military commander. Hadrian honoured Agrippa by placing this inscription on the frieze of the portico – M*AGRIPPA*L*F*COS*TERTIUM*FECIT. The Pantheon was a temple honouring the 12 most important classical gods of Rome: Jupiter, Juno, Neptune, Bacchus, Apollo, Diana, Mercury, Minerva, Mars, Venus, Vulcan and Ceres. In 609 AD, the Pantheon was consecrated as a catholic church, Sta. Maria ai Martiri, which may have helped preserve it. That did not prevent Pope Urban VIII, a thousand years later, from stripping the bronze roof from the ceiling of the portico and melting it down for the baldachino at St. Peter’s and the cannons of the Castel Sant’Angelo. 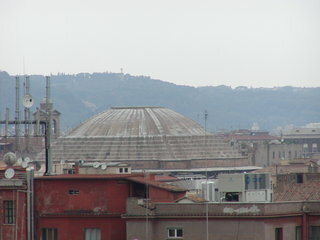 The Pantheon was built on the Campus Martius or the ancient Field of Mars. Today the Pantheon is on the southern edge of the Piazza della Rotonda, considered by some to be one of Rome’s more picturesque squares with the pre-requisite fountain in the middle and yet another obelisk. The Piazza is always crowded, with people sitting in the cafes, hawkers pushing their wares, street musicians performing cacophonously, faux centurions offering themselves to be photographed, boxed in by buildings, and littered with debris, giving it an air of lively decrepitude, but somehow not detracting from the magnificence of the Pantheon. Walking into and seeing the Pantheon that first time that first week in Rome literally blew my mind! The simplicity of the structure, the wide open circular space, the dome with the oculus through which the sun’s light came through was just breath-taking, an uplifting, maybe even religious experience! The hordes of people did not detract from the experience but did fuel a resolve to come at some other time, numerous times if need be to experience this place under more peaceful circumstances. Sitting down underneath the oculus, I remember the information: the height and diameter of the dome are an identical 43 meters, creating a perfect sphere, apparently a symbol of spiritual perfection. The dome is also thinner on the top and has an occulus to enable the base to support it's weight. The occulus is 9 meters in diameter allowing the sunlight in, through which you also see the sky. The occulus and the doors are the only sources of natural light and the light through the occulus moves in a reverse sundial effect. 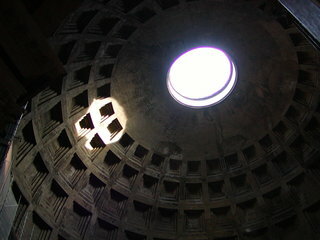 Looking up at the occulus can be mesmerizing, be careful though lest you leave the Pantheon with a stiff neck! ﻿The interior design is dominated by squares and circles. The floor has a checkerboard pattern, while the ceiling is adorned with concentric circles of squares. Directly underneath the dome are niches which at one time may have contained the statues of gods. Then one sees the columns, the high altar and the apses. In addition there are three niches and three chapels. King Victor Emmanuel II is buried in the second chapel and Raphael, the painter is buried in the third niche near the third chapel. Reading accounts of travellers to Rome modern and from long ago, it becomes apparent that the sight of the Pantheon has been and will continue to be an awe-inspiring sight! And as if to underline it's uniqueness, even in this city of mind-blowing sights, it can be seen easily in any panoramic view of the city, resembling an upside down chinese bowl, unique in this city of domes.